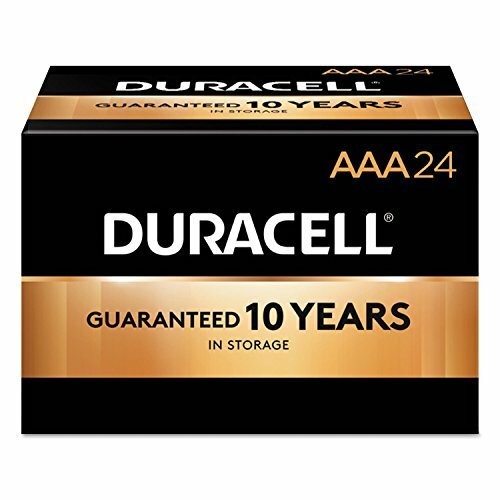 Duracell CopperTop All-Purpose alkaline batteries are not only dependable, they're also long-lasting. You can take comfort in a 10-year guarantee (5-year guarantee for 9V) in storage with Duralock Power PreserveTM Technology. They're great for many of the devices you use on a daily basis. And from storm season to medical needs to the holidays, Duracell is the battery you can trust. Battery Type: Alkaline; Battery Size: AAA; For Use With: Everyday Electronic Devices; Voltage: 1.5 V.
Guaranteed to protect your device from damaging leaks. Should your device be damaged due to a battery defect, when used as directed, we will repair or replace your device.